The Greiner Growth Model describes the different phases that organizations undergo as they grow in size. These phases are agnostic to organization type – they apply to all organizations in all industries. The model is essentially a tool organizations can use to understand the underlying reasons for problems a growing organization is likely to encounter. This makes it possible to anticipate these problems before they occur, and thus take steps to avoid them completely. In this stage the founders run the company. They are entrepreneurial and focused on getting products to market. However, as the company grows they struggle under the burden of managing the company (paperwork and administration). The founders are stressed, and arguments about key decisions ensue, leading the company to a leadership crisis. The obvious first step when this happens is to put in place an operationally minded business manager. Once the business manager is successfully installed, the company enters its second growth phase. Here the business has an organizational structure and communication begins to get more formal. As the organization grows ever more complex though, the management team are no longer able to directly manage all ongoing activities, and the company enters an autonomy crisis. To solve this the company uses delegation to empower lower level managers. The next phase is delegation, where the company leaders are now managing by exception and decision making is based around periodic reviews. Cost centres may start to be introduced. As the company grows, these different cost centres begin to make decisions to meet their own functional or departmental objects, forsaking the greater good of the organization, and the organization enters a crisis of control. The solution to this problem is to move from control to co-ordination. In this phase the organization moves away from functional units and into product groups. Horizontal support functions are established within the organization during this phase. Now that the organization is based around product groups the organization can grow once more. Over time, however, the company enters a red tape crisis, whereby the focus on process which allowed the organization to grow now becomes the goal rather than the means to achieve the goal. In this phase the organization becomes matrix orientated with product focused teams spread across multiple functions to enable growth once more. Eventually, the organization enters an internal growth crisis – the organization is becoming more and more slow and unable to adapt rapidly to changing market needs. The organization tries to overcome the internal growth crises by entering into alliances, such as mergers, or having a holding company to run the different businesses separately. The model can be used periodicly to help you understand potential growth problems in your organization. Step 1: Determine which phase of the model you are in currently. Step 2: Determine if you are close to the crisis point for that phase. 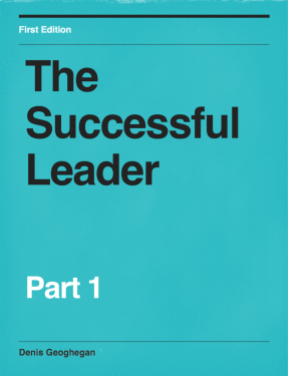 Step 3: Determine what steps need to be taken by you and your team to make the transition to the next phase as smooth as possible. Step 4: Track lessons as the change progresses. Step 5: Repeat the process every 6 to 12 months. 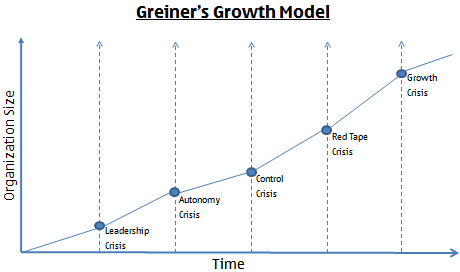 The Greiner Growth Model can be used to help you understand growth issues in your organization. Used consistently and regularly it can help you to spot these growth problems before the occur and thus take the appropriate actions to avoid them.